Former Secretary of State Hillary Clinton attends the Broadway a cappella musical "In Transit", at Circle in the Square Theatre, on Wednesday, Feb.1, 2017, in New York. 'Teen Vogue" announced that Clinton will guest edit its upcoming issue. Hillary Rodham Clinton has come to "Teen Vogue." The magazine announced on Wednesday that the former secretary of state and presidential candidate has guest edited a special edition of “Teen Vogue” hitting newsstands on December 5. Clinton says she’s a fan of the publication’s breadth of coverage and enjoyed engaging with readers of the magazine whose politics are different from her own. The announcement comes exactly a year after her defeat to Donald Trump during the 2016 presidential election. 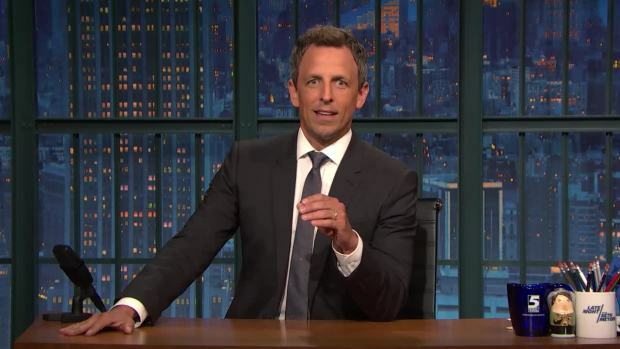 In his segment, "Hey," Seth Meyers gives Hillary Clinton some real talk about the sections of her book, "What Happened," on Donald Trump and Bernie Sanders. The upcoming issue will feature a letter that Clinton wrote to her teenage self, features on her daughter Chelsea Clinton and a list of powerful women, under the age of 21, “radically” changing the world.